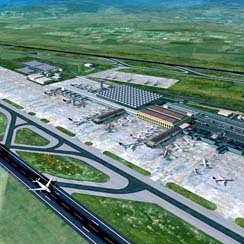 There have been finished works of the second airfield at Malaga airport, which will double the airport’s capacity from January 2011. This infrastructure will culminate the “Malaga Plan” regarding the expansion the airport, and allows up to 72 takeoffs and landings each hour. It started in summer 2007 at a time when Malaga airport offered clear signs of saturation. And it is finished just in time to be at the head off of these new facilities which each month highlight the recovery of tourism in the Costa del Sol. From 2012 it will double the number of arrival and departure operations with up to 9,500 passengers per hour and up to 30 million a year. Furthermore, Malaga airport will become the fifth airport in Spain with more than one airfield (after Madrid, Barcelona, Palma de Mallorca and Gran Canaria). This infrastructure is together with the arrivals terminal T-3 (in service since last year) the most important in the “Plan Malaga”. Other milestones are the tunneling and the construction of a new commuter train station, opposite the T-3, the improvement access and expansion of parking.